By Srinivas Chowdary Sunkara // petrobazaar // 4th February, 2019. 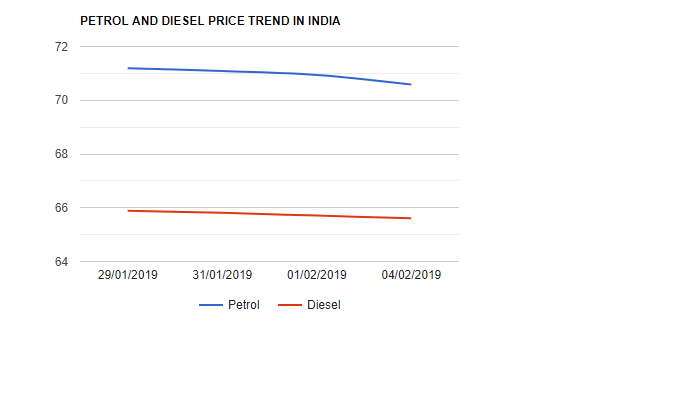 Petrol and Diesel prices fell for the fifth day under the mechanism of daily price revision of motor fuel oil prices in India. Today, Petrol prices are decreased by 15 paise per ltr or 0.2% to Rs.70.59 while diesel has become cheaper by 10 paise or 0.15% to Rs.65.61 per ltr in New Delhi. Both the auto fuels were spiked during the January month. Petrol has become dearer by Rs.2.25 or 3.2% and diesel price is surged up by Rs.2.95 per ltr or 4.6% in the January month. The D.P of petrol and diesel are built up by 48 paise and 97 paise which in turn raised RSP by 61 paise and Rs.1.12 per ltr subjectively. The crude bench mark prices in the global markets were ended with weekly gains during the last week followed by a strong job data and drop in U.S rig numbers as reported on Friday. The motor fuel oil prices are expected to be in range bound in the short term.